The written scripture tells a story like ordinary literature… but wait! Look closely. Meditate. Just when you begin to read the Bible, you get to Genesis chapter 5 and read a long boring list of Adam's family tree. 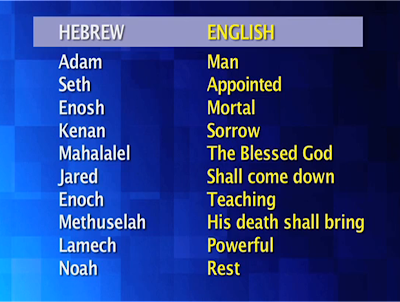 Here is the list of the line of Noah from Adam. Man appointed mortal sorrow. The blessed GOD shall come down teaching.His death shall bring powerful rest. Again it is pointing to a person and this time it tells of His death that will bring about powerful rest. Each letter of the Hebrew alphabet or Alephbet is rich in meaning. Each letter has its own character. Each stroke has significance that writing a Sefer Torah demands meticulous and skillful hand. There are over 4,000 laws specifically for writing a Sefer Torah alone. Violating one of this law voids the whole work. Hebrew words are also read in their number representations called gematria. Each letter also stands for a number. Much like how the Romans used some of their letters to represent numbers (I=1, V=5, X=10, L=50, C=100, M=1,000), all Hebrew letters have numeric values.